Yesterday, I took the train to York to visit The York Dungeon. I’ve walked past The London Dungeon before, but even after a few visits to York, I did not know there was a similar experience there. Truthfully, I also had no idea what these dungeon experiences were even about, but now I know! When I arrived, I was greeted outside of the entrance by the Ringmaster of Carnivále, which is the current sideshow at The York Dungeon that runs until the 1st September. Before the tour begins, I had my photo taken holding a board declaring the crime I was convicted of (‘Being a Witch’) and another of me looking shocked. In the second photo, they make it out to seem you are looking at a body during an autopsy and you are not aware of that until you see your photos at the end of the tour. (You can purchase these photos in the gift shop.) Well, I looked like I was busting a move above the body – hilarious! As my group waited for our tour to begin, we sat in a corridor to make us feel like we were in Clifford’s Tower listening to the talking head of Robert Aske, a Yorkshire lawyer during the reign of Henry VIII. He gave an introduction to the dungeon tour and warned us about Henry VIII. It’s quite cool as the ‘talking heads’ are images of the faces of actual actors that are projected on a faceless mannequin. We were then introduced to a former washer of robes at St Mary’s Abbey in 1541. He lost his job when Henry VIII took over all of the churches. The man was attempting to pillage the room of its valuables before Henry VIII and his men caught us. This first show started off with a scream as the man came flying into the corridor, so I think most of us were on edge for a good portion of the 80ish-minute tour. I’m not a big fan of scary movies or haunted houses, so the prospect of something jumping out at me was slightly unnerving. This did definitely add to the atmosphere of the dungeon. I found some of us never wanted to be the first to enter a room or the last to leave a room. It was during these times when I wished I was there with a friend or Richard (also a scaredy cat like me!). We then moved through a series of other rooms with the majority of the shows being done by live actors and only a couple being told by the talking heads or a recorded narration. There was actually quite a lot of historical information to absorb throughout the course of the tour. Some of the highlights for me included: hearing a recording from ‘Guy Fawkes’ of his role in the plot against Westminster on the 5th November 1605 and his subsequent torture once caught, listening to the story of the Ghost of York from 1821 as told by the very animated pub landlord who witnessed the hanging and then the appearance of said person’s ghost in his pub, a demonstration on an unsuspecting tour member by the torturer of his various instruments, and the equivalent to a dark yet comedic stand up show involving the talking head of Eric Bloodaxe as he tells tales of the Vikings bloody invasion against the English complete with heckling by the talking head (on a stick!) of an Englishman he had beheaded. My favorite of all of the shows was one in which we met the doctor’s assistant during the time of plague in 1551. We heard about the symptoms of the plague and the methods they used to attempt to heal those with the plague. We even played witness to a bit of a ‘live autopsy’! The assistant was just a little mad, which was completely understandable seeing as she would have dealt with such doom each day. This actress played her part extremely well and her dry sense of humor really added to this portion of the tour. She used a member of the tour to really engage us and the moments of pitch black kept us all guessing as to what was going to come next. From the first live show of the tour, I could tell the actors were knowledgable about their respective times in history and each of them really got into their parts, particularly the pub landlord and the doctor’s assistant. They use humor that appeals to all ages (There were even a few innuendos thrown in for the older crowd!) and great storytelling to provide a synopsis of the darker times in York’s history. There are little surprises along the way, but I don’t want to give too much away because I really do feel it adds to the drama and atmosphere that they set out to create during the dungeon tour. There are typically 24 people in each tour group, and the group members ranged in age from about 8 to 60ish years old. Everyone, but me, was there with someone else. It wasn’t awkward being there on my own because you tend to chat to others as you connect over your shared desire not to be frightened! The York Dungeon experience is most definitely a tourist attraction, but it is well worth a visit if you don’t know much about the dark history of the city. I think it would be a neat place to take some of our U.S. visitors as York is typically one of the places we tend to take people on our tour of Yorkshire. 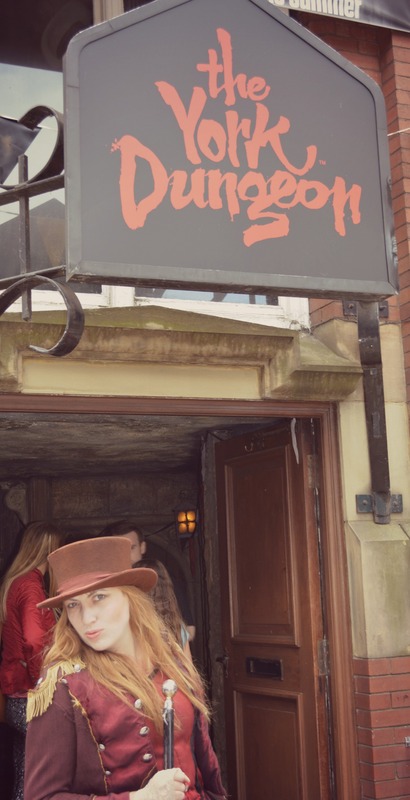 I really did enjoy my visit to The York Dungeon and would certainly recommend it! I was provided a ticket by The York Dungeon for purposes of review. All of the opinions are honest and all photos are my own. I promise to always share my honest perspective when doing reviews. Don’t hesitate to ask if you have any questions.